It's episode 168! Some big news happened recently. Most of it regarding season 7. But we have other news to share! Like Ashleigh Ball attending several conventions, a trailer for Ponies the Anthology 6, new toys, and more! Nemesis bought more Funko Mystery Minis! We talked about these very briefly on the podcast, but why not unbox a few and talk about what he thinks of them? Another review! It's the one and only Adagio Dazzle! How does she (and her hair) stand up? We did a video review! Well, Nemesis did. 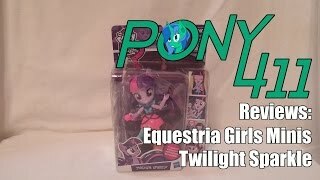 The newest wave of the Equestria Girls Minis is slowly coming out, and we got our hands on two of them! First, it's Twilight Sparkle. Episode 167 is here! Again, not a ton of news this time. But we still have con guests, animations, a new comic series, and more! Time for episode 166! There's actually not a whole lot of news this time around. Well then. But we still have bits such as a silly animation, K'NEX ponies, some commercials, and more! Episode 165! It's here! And it once again brings two weeks worth of news. News like more info from 2snacks, a couple of Fallout mods, some potentially big comic news, and more! Time for episode 164! We once again have two week worth of news. Oddly enough, there's not actually a lot of it. But we still have convention announcements, fan games, surprise toys, and more! Episode 163 is out! And it's our first hiatus episode. Yay? Anyway, we have two weeks of news. 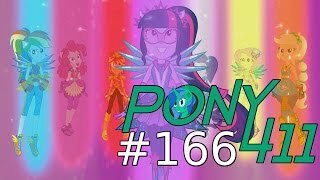 Bits like several fan animations, new Equestria Girls Minis, and more! No seriously, there's a lot more. Episode 162 is here! And it has quite a bit of news. 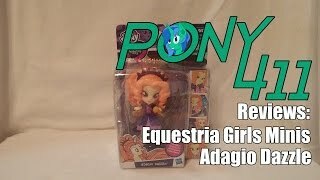 News like the official Hasbro convention, new Equestria Girls Minis, details on MLP in 2017, and more! Episode 161 is a thing that is happening! It starts with the usual news. It includes stuff like convention guest announcements, The Puzzle Party game's official release, a bit about season 7, and more! It's time for episode 160! There's not a whole lot of news this week. 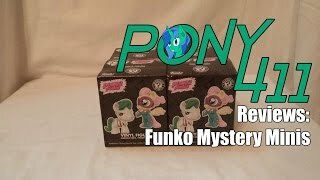 GalaCon 2017 details, new Funko Mystery Minis... Oh, and season 7 confirmation! Yes, it's happening. That, and more. Welcome to episode 159! There's actually very little news this week. But it does have stuff like a new comic series and the rest of the season airing early. And more! Episode 158 is here! And of course, we have the usual news. Con announcements, a TEDx talk, and a flash game. Oh, and apparently Legend of Everfree is out early... In English. Oh. Hello listeners, it's time for episode 157! We don't have a lot of news this week, but we'll still report on it! 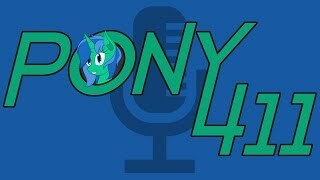 We got one piece of con news, more about new brushables, the Legend of Everfree soundtrack, and more! Time for episode 156! We have a a bit of news to share this week. Some of it is big, and there's one thing that can potentially be big. There's stuff like an album re-release, a new convention, the synopses for a few upcoming episodes, and more! Episode 155? Sure! Let's do that. It's a shorter one this week, mostly due to a small amount of news. But it's still good! 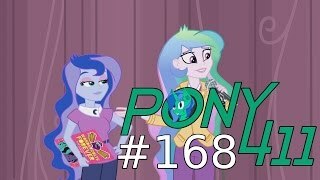 Some of it includes convention comics, new Equestria Girls Minis, a new episode synopsis, and more! Welcome to episode 154! We got some news for you! Two weeks worth. Cons have that effect. Some of it includes the usual convention announcements, Pokemon, plushies, a new synopsis, and more! The end of episode 153! This time, we talk about "The Times They Are A Changeling!" You know, the new pony episode? Oh, and a couple of news items. The final day of BronyCAN! Today was also fairly eventful. Day 2 at BronyCAN! We did a bit more than yesterday. The first day of our BronyCAN experience! Plus a little of day zero. 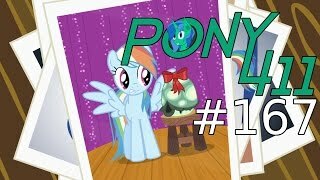 Pony 411 Episode 152- It's Just A Prank, Bro! ZOMBIES! Ahem. Welcome to episode 152! Would you like some news? Good. Because we have some, including con guests, a pony mod for an old game, Legend of Everfree clips, and more! That last one might have a bit of a surprise from one of the hosts. Episode 151 is here! And it brings a bit of news! Some fan games, toys appearing online, and several clips from Legend of Everfree! And more. Welcome to episode 150! Another milestone for us. Hard to believe we've been around this long. But anyway, we have news! Several convention announcements, toy sightings, episode synopses, and more!